Mulranny – last stronghold of the Old Irish Goat? The Old Irish Goat is essentially a cold-weather goat that developed rapidly during a period of intense cold and poor nutrition. It is what people think of as the ‘cashmere’ goat. In Asia, it is represented by the Central Asian Pashmina Down goat. The goat reflects its cold weather origins. It has a compact conformation, with short legs; a long face to warm the air in the nasal passages; a thick coat with under-wool to keep out the extreme cold; small ears to protect against frostbite; and a large belly to accommodate large quantities of nutritionally poor forage. The Old Irish Goat has a popular association with the Burren, but sadly the breed is in dire straits there. Mass removal and cross breeding with improved goats, including Anglo Nubian and Swiss dairy goats, has reduced the Old Irish to less than 10 per cent of the population. With those remaining being somewhat aged, their future is bleak. Saving the Burren Old Irish Goat requires enclosure and a major concerted effort. It is unlikely that an Old Irish Goat herd will ever again roam the Burren. The quest to find a representative herd of Old Irish Goats in Ireland brought Professor Ray Werner to Mulranny in 2011. His journey began 50 years before, at 16 years of age, when he first studied feral goats. He would go on to pioneer the concept of the Northern Breed Group and found the British Feral Research Group. He has worked with the Old Irish Goat Society in the Burren over several years, and published an article on the Old Irish Goat in the Heritage Outlook magazine in summer 2009, seeking information on other herds. He got one response – from Mulranny. Arriving in Mulranny, last weekend, Ray was immediately struck by the ‘Irishness’ of the Mulranny goats. 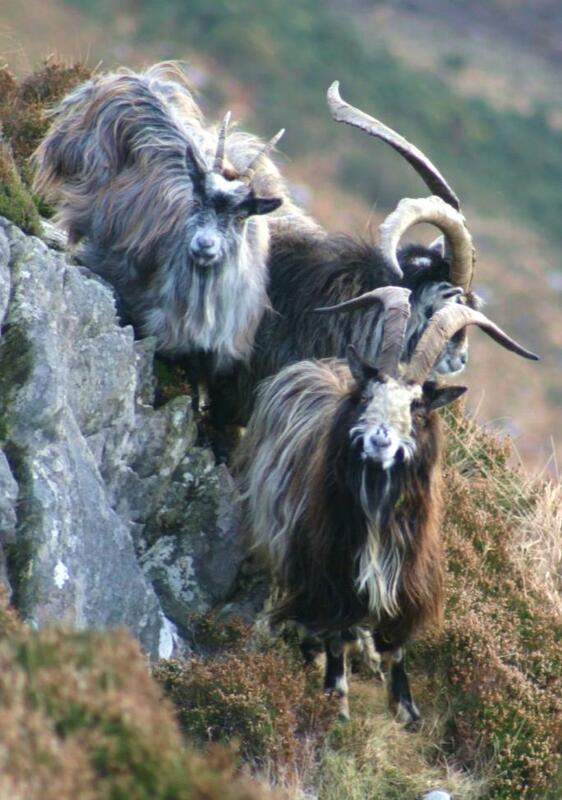 In comparison to the goats of the Burren, many in the herd had the characteristic small size, long hair, dished forehead, some remarkable oversized quiffs and magnificent horns on the males. 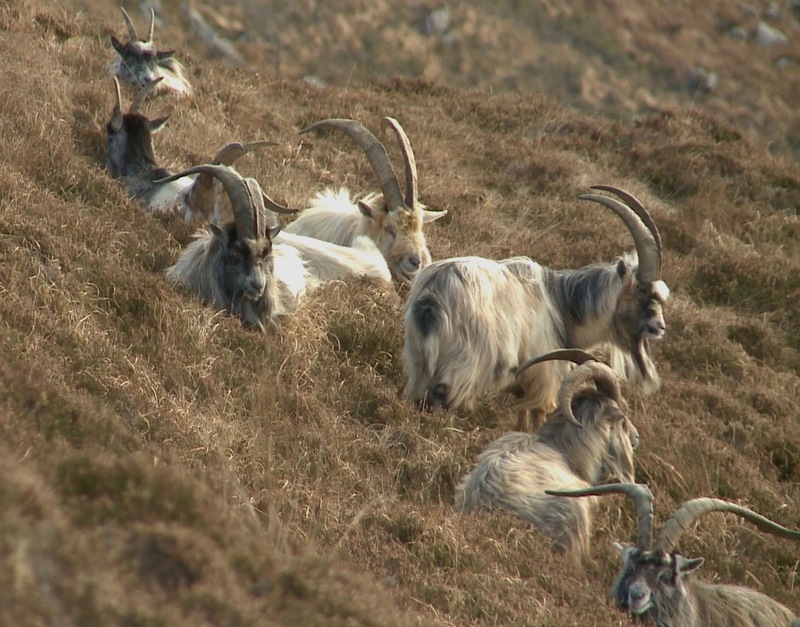 Accompanied by Seán Carolan (Mulranny Environmental Group), Ruth Enright (PHD student at UCC) and Colin Johnston (Old Irish Goat Society), Darragh McCarthy (cameraman) shot high-definition footage of the goats over three days in perfect conditions. The group, promptly christened ‘the Save the Goats Brigade’ by one local resident, were later joined by Joan O’ Sullivan and Enda O’Byrne from the RTÉ Nationwide crew. During one of several interviews with local residents, on of the most important scientific discoveries for genetic typing of the Old Irish Goat was made: A local farmer had a stuffed goat’s head dating from 1895 mounted at home! This goat had roamed the Mulranny hills before the arrival of the railway. Both Ruth and Ray were stunned in disbelief; Ray commented that ‘not in his wildest dreams would he have thought it possible’. With only a handful of these artifacts in Ireland, this is probably the most important specimen in the country. The Old Irish Goats have a long lineage, stretching back beyond the Neolithic Age to the Ice Age, two eras that have left an indelible mark on the Co Mayo landscape, from the Céide Fields to Clew Bay itself. They are literally, as old as the hills. The presence of these goats in reasonable numbers in Mayo is another chapter in the county’s long history as a refuge for declining species.